Confessions of a Fashion Fanatic: Happy Friday! Simian Mobile Disco was a bit of let down last night, and I'm sad to say that me and my girls Ovitch and Steph A. left before the set was even over. 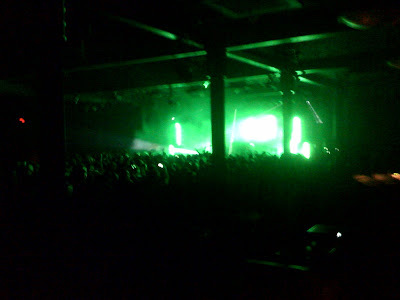 The crowd skewed a little young (I'm an "old" hag these days), and the bigger venue made the show seem more like a rave. I preferred the first SMD show I saw a couple summers ago, which was at a much more intimate location. Anyway, it may have been a disappointment but the hot dog I ate after wasn't. Until this morning. Those LV headpieces made the models look like haute version of Minnie Mouse. Or a wacky version of Alice in Wonderland black headbands. Adorable. And burgundy wine colors with metallic silver? C'est chic! Here's a bit of Louis Vuitton from me to you (there's been a lot of peplum and more than some midriff-baring this season, non?). I'm Lovin' it: Chillin' like a villain tonight at Ovitch's for the hockey game and homebaked cookies. Mainly because Fo'sho Shawna's birthday tomorrow night requires me to get a full eight hours rest. I'm Over it: Rain is coming. I feel it in the air. Noooooooooooooooo. 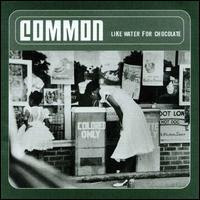 And the fact every time I try to download Common's Like Water For Chocolate album from 2000, it never works! Track of the Day: "The 6th Sense" by Common.